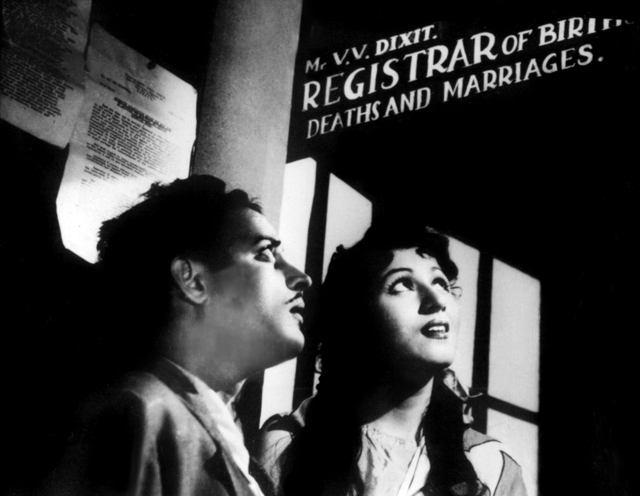 Pyaasa might be more celebrated and Kaaghaz Ke Phool more revered, but what makes Mr. &Mrs. 55 so unique is that it is a manifestation of one of those rarest of creatures: trademark melancholic director Guru Dutt in a pleasant mood. Step right up ladies and germs – see Guru smile and laugh, and make us laugh with his sucker-punch delivery; and for one time only (why, oh why?) see him share the screen with the Venus of Indian Cinema, Mumtaz Jahan Dehlavi a.k.a. Madhubala – she of the impossible beauty, disarming lop-sided smile and impeccable comic timing. 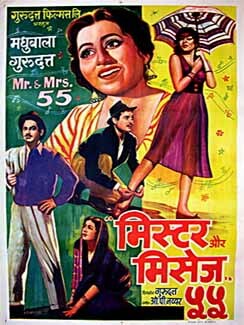 Part screwball comedy, part battle-of-the-sexes farce, and part musing on the emergence of ‘modern India’ (note its clever use of Anton Karas’s infectious zither tune from The Third Man), 55 is a delectable little dish with some mighty impressive ingredients in the mix. Besides its two lead players, throw in comedy giant Johny Walker to up the ante, and add a dash of ‘queen of mean’ powerhouse Lalita Pawar for good measure. Flavour generously with V. K. Murthy’s stunning, richly textured black & white cinematography (it’s a crime that this man was never even nominated for any international award). Then stir in Abrar Alvi’s deliciously spicy rat-a-tat-tat dialogue – “Tum iss kaabil nahin ho ke koi shareef insaan tumse baatein kar sakay. Ab mera vakil hi tumse adaalat mein baat karega” – “To aapke vakil sahib shareef nahin hain kya?” And to top it off, garnish with O.P. Nayyar’s scrumptious music. The music – ah, the music! And what music it is. Nine wondrous tunes set to Majrooh Sultanpuri’s splendid lyrics – smart and zingy here, achingly romantic there – and sung by the likes of Mohammed Rafi, Shamshad Begum and the ethereal Geeta Dutt. This super team had of course convened previously for Guru Dutt on Baaz and Aar Paar, and here they continue their memorable work, some of the songs echoing their earlier outings and yet displaying an endearing individuality. One of the most striking things about the songs of 55 is that they are very much native to the film. Instead of the the hackneyed pyar-mohabbat-ishq terminology, O.P/Majrooh opt instead for mood and imagery springing directly from the film’s plot and the unique situations it presents. These songs are not formulaic; you can’t lift one from point A and shift it to point D. Each song is perfect in its place – or as we say in these parts, ‘tich’ baitth-ta hai! When’s the last time you heard the word raagni in an Indian film song?? On screen, the song is yet another example of yesterday’s imagination winning points over today’s gaudy excesses. The setting is simple – a newspaper office – the choreography is minimal, with just two characters and no jetting off to Switzerland for three minutes, no chiffon and tinsel, no gaggle of chorus dancers, no thrusting pelvises flying about. And still the song is more creative and enjoyable than any “Kaal kaal” or “Saaqi saaqi”. Musically a companion piece to other O.P/Majrooh sort-of ‘cabaret’ numbers like “Hoon abhi mein jawaan ae dil” from Aar Paar, “Neele aasmani” may be one of the lesser known ones, but for my money it is one of the sexiest, without suggestive lyrics and without anyone on screen dropping their clothes. As this dark, almost bluesy tune unfolds, listen in wonder to Geeta Dutt’s sultry enunciation of the two title words – like being draped in satin or, to borrow an image from another of Madhubala’s famous films, having your face caressed by a silky feather. Goose-flesh is practically guaranteed. Visually, too, this is a stunning set-piece with a bold film noir lighting design and dynamic editing comprising audacious changes in shot size. And of course it helps that it’s lip-synched by that ‘cabaret dancer’ par excellence, the gorgeous Cuckoo. There are three more songs in the film – the corny-but-good qawwali “Meri duniya lut rahi thi aur main khamosh tha”, Shamshad Begum’s gypsy number, and the all-too-brief pathos-soaked “Preetam aan milo” – that together with the rest make for a superlative sounstrack. Listening to these songs also makes one keenly aware just how versatile an artist Mohammed Rafi really was. Here he is, singing in one film for three vastly different characters – the hero, the comic, and a street qawwal, and he is able to make each corresponding vocal completely distinct. And he has a more-than-worthy companion in Geeta Dutt, herself a vocal chameleon who could sing with a zing in songs like “Mera naam chin chin choo” and just as effortlessly bring the proverbial lump to one’s throat with a “Waqt ne kiya kya haseen situm” or “Aaj sajan mohe ang laga lo”. On a different note, not long after 55, O. P. Nayyar would infamously shift his loyalties to then-newcomer Asha Bhonsle, effectively causing a near-drought in Geeta’s career that was only relieved by the occasional quality work in a quality film, mostly with estranged husband Guru Dutt. Geeta died in 1972, leaving behind a remarkable legacy sealed with her swansong in the form of three beautiful tunes for her brother, composer Kanu Roy, for the film Anubhav, which was released posthumously. 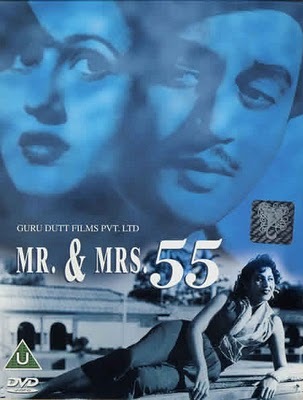 If you are looking to educate yourself on Indian film music, or simply in the mood for a fun classic, Mr. & Mrs. 55 is not a bad place to start.